The software in this repository is free and open-source software, provided AS IS, with NO WARRANTY OF ANY KIND. Feel free to use, share and modify the software in this repository, always keeping the original authorship information at the beginning of each script intact. All of our software is licensed under a Creative Commons Attribution 3.0 United States License. 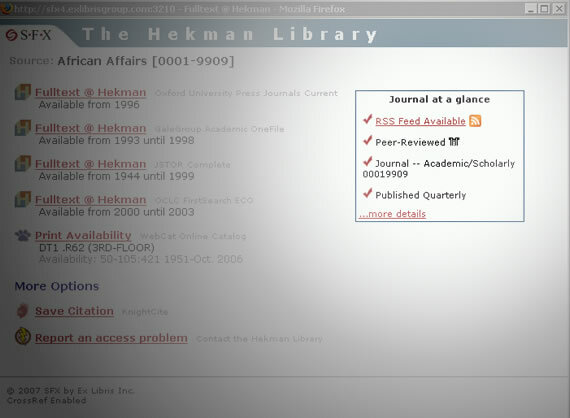 The At a Glance feature of the Hekman Library SFX Services Menu unobtrusively displays useful journal-level metadata and relevant links. The At a Glance information is pulled directly from Ulrich's Periodical Index, and includes a link directly to the journal's detailed display on Ulrich's website. Because the SFX template system does not allow external data to be included into the HTML output at compile-time, AJAX is used to retrieve the At a Glance data and render it. Place get_journal_info.pl on your SFX server or on another server of your choice. Note: if you do NOT place the get_journal_info.pl script on your SFX server, you will need to come up with some way to circumvent the security restrictions that limit AJAX requests to the initial web server. A proxy script (see below) can be used on the SFX server to circumvent this restriction.